The Oil States Leak Repair Clamp (LRC) is a split-sleeve, clamp-style fitting designed to encapsulate and seal off localized pipeline leaks. This robust clamp comes in structural and non-structural designs and is the preferred method for permanently repairing pinhole and crack-type pipeline leaks. Hydraulic cylinders are used to assist with the open/close functions. Quick installation design makes use of hydraulic stud tensioners to tighten the body and seal bolts for a permanent, environmentally safe repair. See repair clamp animation here. 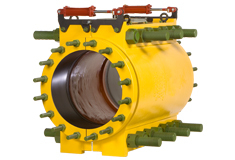 Circumferential seals that are energized by tightening the end bolts of the clamp. Hinges and hydraulic cylinders assist with the open/close functions during installation. Stud tensioners are used to tighten the body and seal bolts.